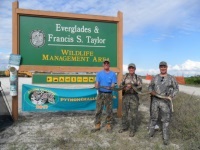 The Florida Fish & Wildlife Conservation Commission (FWC) and partners launched the 2013 Python ChallengeTM (January 12 – February 10, 2013) to enlist the general public and python permit holders in a concentrated, month-long harvest of invasive Burmese pythons from state lands in Florida. The primary goal of the Python ChallengeTM was to raise public awareness about Burmese pythons and their impacts on native wildlife and ecosystems. Twenty-four python permittees and 1558 non-permitted “general competitors” registered for the Challenge and collectively removed 68 Burmese pythons, the highest number ever removed from those areas in a comparable amount of time according to FWC’s records. Mazzotti, F.J., M. Rochford, J. Vinci, B.M. Jeffery, J. Ketterlin Eckles, C. Dove, and K.P. Sommers. 2016. Implications of the 2013 Python ChallengeTM for Ecology and Management of Python molorus bivittatus (Burmese Python) in Florida. Southeastern Naturalist 15(sp8):63-74. Harvey, R.G., L. Perez, and F.J. Mazzotti. 2015. 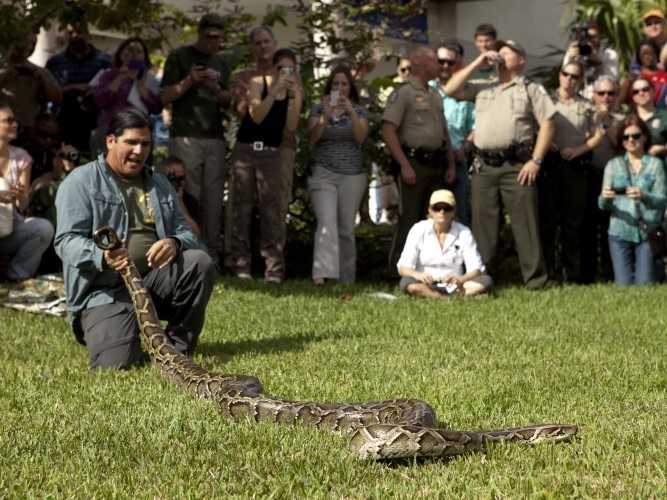 Not seeing is not believing: Volunteer beliefs about Burmese pythons in Florida and implications for public participation in invasive species removal. Journal of Environmental Planning and Management 59(5): 789-807. Harvey, R.G., L. Perez, and F.J. Mazzotti. 2015. Concern for invasive Burmese pythons (Python molurus bivittatus) among participants and non-participants in the 2013 Python Challenge TM. 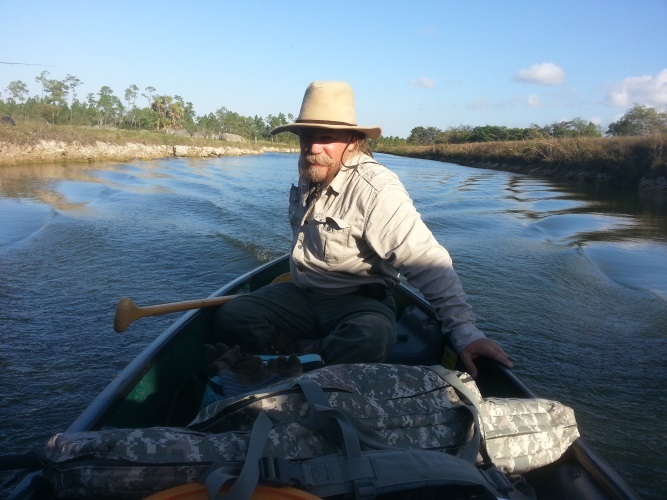 Greater Everglades Ecosystem Restoration Conference: Coral Springs, FL, April 21–23, 2015. Harvey, R.G. and F.J. Mazzotti. 2013. 2013 Python ChallengeTM Human Dimensions Survey (PDF). Summary Report to the Florida Fish and Wildlife Conservation Commission. June 2013. 33 pages.